Have you eaten matcha marmalade cakes before? No? They’re well worth trying. 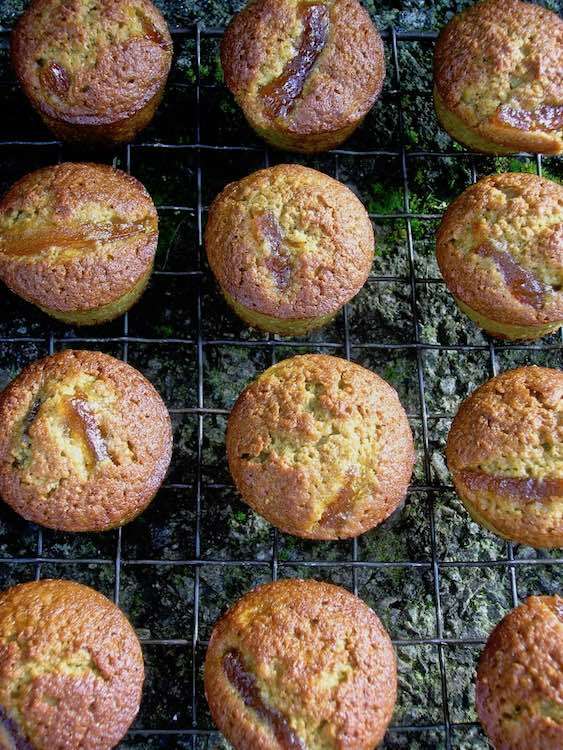 These little bites are flavoured with healthy green tea powder and marmalade. They’re not only delicious but also quick and simple to make. It’s been a while since I did any baking with matcha. Last week provided the perfect opportunity. We’d been invited to eat sushi with a Japanese colleague of CT’s which I was hugely looking forward to. A few little matcha cakes, I thought, would make a suitable post prandial snack. As I mulled over what flavour I should pair the matcha with (mostly in the early hours of the morning) I kept coming back to citrus which I thought would give a fresh and zingy high to the bitter notes of green tea. But, unusually for me, I had no fresh citrus in the house, not even lemons. With time fast running out I made a last minute decision to add some of my mother’s marmalade to the mix. Two bitters together can work really well – think coffee and chocolate. I was hoping this would also provide some of the zing I was looking for. Well I couldn’t have been better pleased with how these mini matcha marmalade cakes turned out – well maybe they could have been a bit greener in colour. They were light in texture, greenish, had a mild matcha flavour and a delicious marmalade hit. CT and I were hard pressed not to snaffle one on the train on our way to our hosts. Just as well we didn’t as they all disappeared with remarkable rapidity. How anyone managed to fit them in is a miracle. We had the grandest sushi spread I’ve ever come across. It was a self-assembly job; nori seaweed was provided along with what seemed like hundreds of fillings. As the only vegetarian there, I was still well catered for – omelettes, mushrooms, cucumbers, natto, asparagus, okra, radishes, beans, cress and all the usual accompaniments and condiments. Four hours of eating and sake drinking and we were still able to knock back a few cakes and lashings of a flowering green tea. My matcha marmalade cakes were not the only desserts. 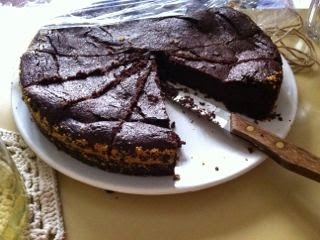 There was a lush chocolate cake as well as a banana tarte tatin. How we managed to stagger back to the train station and home I’ll never know. I’ve named this year Super Sushi. I reckon I’ve eaten more of it this year than all the other years combined. It all started with our bloggers session at Yo Sushi and snowballed from there. Only two days after this sushi feast I got a surprise phone call from a friend who was dashing through Plymouth on his way back to Italy. “Can you make it to Koishii for a Japanese blow out in two hours time?” I dropped everything, so did CT.
I’m sending these off to Elizabeth’s Kitchen Diary for Shop Local as the wholemeal flour is Cotehele Mill’s own, the eggs are local as is my mother’s homemade marmalade. As these were sort of made as a thank you for inviting us over for sushi, I am sending this off to Treat Petite with CakeyBoi and The Baking Explorer. It’s been a while since I submitted anything to #recipeoftheweek over at A Mummy Too, so off these go. Thanks for visiting Tin and Thyme. If you make these scrummy little matcha marmalade cakes, I’d love to hear about it in the comments below or via social media. Do share photos on your preferred social media site and use the hashtag #tinandthyme, so I can spot them. For more delicious and nutritious recipes, follow me on Twitter, Facebook, Instagram or Pinterest. Matcha Marmalade Cakes. PIN IT. 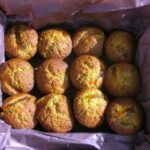 Mini cakes flavoured with healthy green tea powder and marmalade, these are not only delicious but are quick and simple to make. Melt butter and chocolate in a pan over gentle heat. Stir to combine then allow to cool a little. Place sugar into a mixing bowl then sift in the dry ingredients. Make a well in the centre and break in the eggs. Pour in the butter mixture. Stir from the inside out until just combined. Stir in the marmalade. 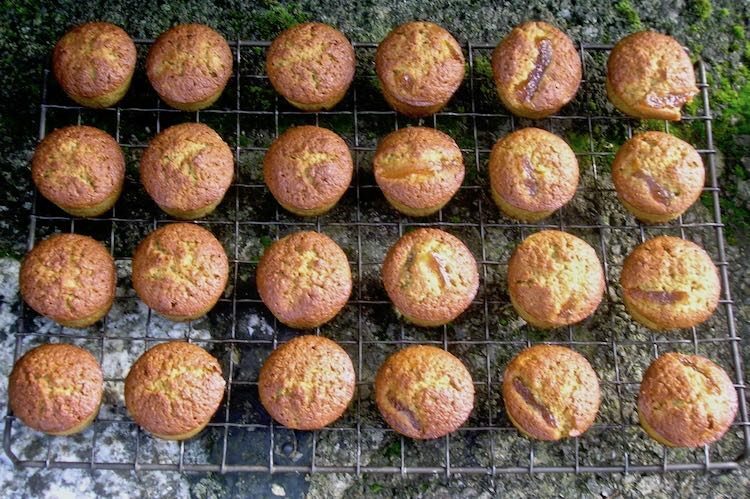 Divide the mixture between 24 silicone mini muffin moulds. Place a shred of marmalade on top of each one. 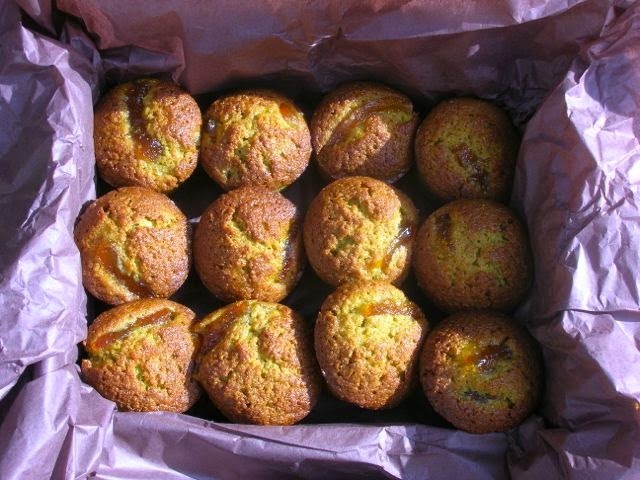 Bake at 180℃ for 15 minutes or until the cakes are well risen and firm to the touch. Makes 24 mini cakes or 12 regular bun sized ones. Please note: calories and other nutritional information are per serving. They're approximate and will depend on serving size and exact ingredients used. These sound really tasty and one I will be adding to my bookmarks to give a try. Thanks for sharing. Thanks Lynsey. Would love to know what you think if you do try them out. Well you’re ahead of me there – I’ve never tried cake in a mug. How unusual these sound, but so yummy! You’re so clever at pairing flavourings Choclette. 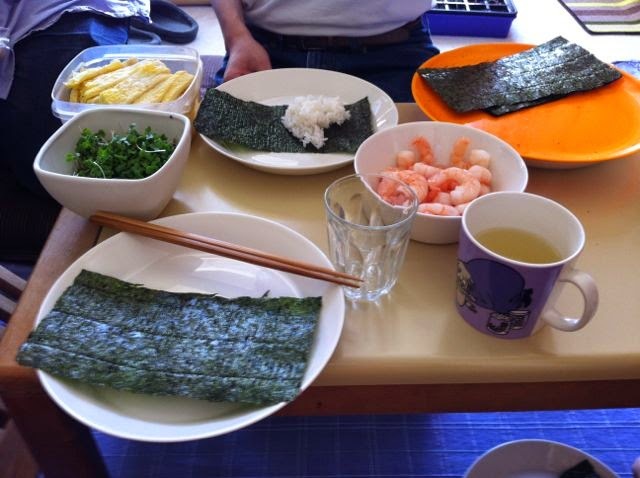 I think I need to have a Super Sushi year, I do love it but have rarely eaten it…and never made it. The sushi feast we had Johanna was putting, pretty much whatever we fancied into the seaweed and then rolling it (very clumsily in my case) into a cone. Makes this super easy and everyone can have just what they like. As for chocolate sushi, I keep meaning to have a go at this and one year I will. Not sure I like the idea of cocoa nibs though – the wrong texture for sushi. Do have a go at baking with matcha – it works splendidly in cakes. I love the marmalade oozing out of the top. Great decision! Love the idea of Matcha cakes, I wonder if you could wholey use almond flour to make them really moist! I expect they’s be lovely just made with almond flour Bethan, but they would have a different texture and probably wouldn’t rise as much. It’s rather addictive stuff GG – I’m just hoping there might be more to come before the year is out! well i’m a huge sushi fan so any kind of sushi feast is OK by me!… love this matcha cakes, they’re so adorable and I love the addition of marmalade. They remind me of my grandma’s marmalade cake although hers were never green! No a green marmalade cake would be a little unusual, unless it was lime marmalade I guess!!! 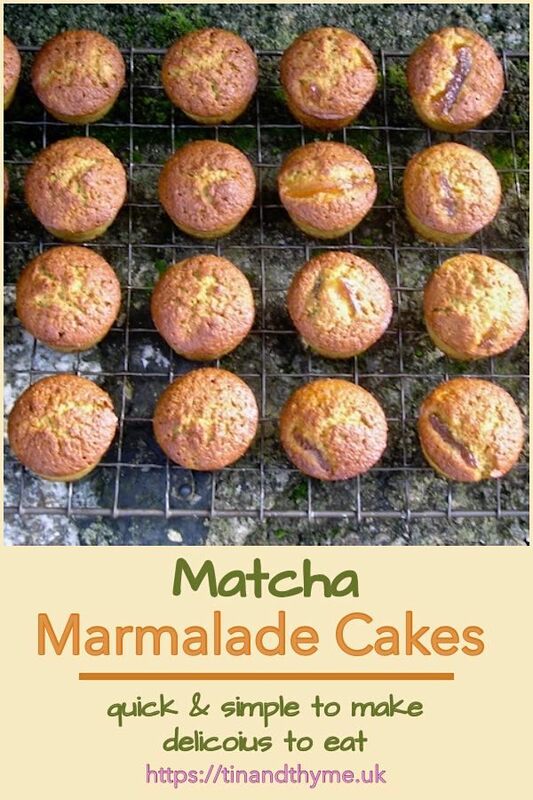 Combining matcha with marmalade did make for super delicious cakes. I love sushi so much!! I have some matcha at home, but never tried it in any cakes yet…. Sushi is addictive stuff Anna. Do try your matcha out in cake form – it works really well and you can have it as strong or as mild as you like. I love baking with matcha too. These mini cakes look awesome! I have a couple of sachets of matcha, should really try it in baking. Your marmalade cakes sound delightful. Thanks Galina – do try a bake with it. You are the tea queen after all! These sound wonderful!! I have never baked with matcha but have from time to time enjoyed cookies or muffins made with them. This post inspires me…maybe it’s time! And I must say, I love alliteration too, so mini matcha marmalade sounds very sweet indeed! Haha, thank Ros – now there’s an idea! oh! There cakes look absolutely fantastic! I’m dying to give this recipe a try! Thank you Marcela, they are scrumptious little cakes and easy to make too. What a perfect little treat to take! I love the combination of flavours…… they sound deliciously exotic. The sushi sounds amazing too…… I love sushi, but we have to be really careful because of the use of soy sauce which mostly contains wheat….. self-assembly would solve it! Thanks Kate, it’s a great combination. I’m wondering if this is a flavour first! We tend to use tamari at home, which is GF, but it’s one more thing I expect most people won’t have thought of. What a trial it must be for you when you just want to go out and eat a good meal. Thanks Choclette – never used matcha before. May give it a go now. Thanks Stuart – matcha just works so well in baking I think. What an intriguing flavour combination! I need to get more matcha. I have an idea for a drink 🙂 Thank you for sharing with Shop Local!